Mauna Kea, a prime destination for the world’s most affluent individuals eliciting thoughts of paradise with its crescent shaped white sand beach which has also been called “America’s Best Beach”. With new developments coming to the area and a multitude of sophisticated amenities, it is the perfect time to come and explore your next home on the Big Island. Words cannot begin to describe the absolute splendor of this lavish home designed by award-winning architect, Mark de Reus. Worth more than the sum of its parts, it’s an architectural work of art you must experience for yourself as you step through its bold teak wood gates leading you inside a truly breathtaking residence, so beautiful it’s dreamlike. The surrounding nature elegantly blends with the homes architecture to display exemplary artistry, craftsmanship and appreciation for the location in even the smallest of details, not a single one overlooked. The impressive 6 bed/8 bath home has over 9,000 square feet of interior living space sitting on over 24,606 square feet of land. 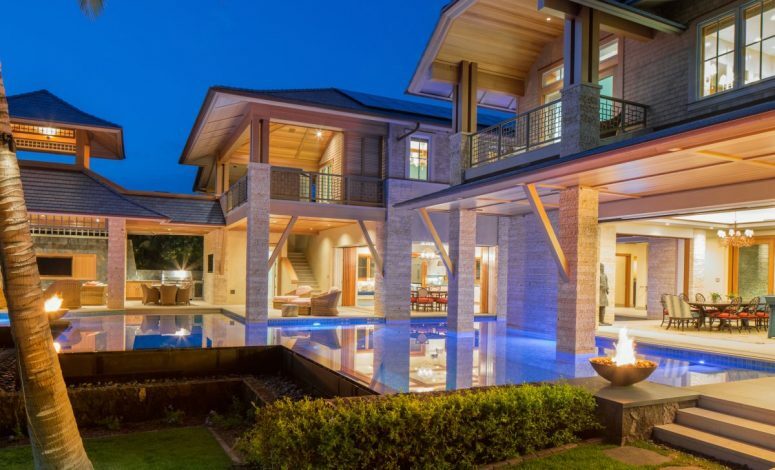 Both inside and outside the home, there’s a variety of fine materials used such as such as coral stone, marble, basalt, travertine, cumaru, teak, ipe, and cedar to name a few. Owners have the opportunity to become a member of the highly regarded Mauna Kea Resort offering members-only access to a multitude of sophisticated amenities. The Robert Trent Jones, Jr golf course at the resort was recently named #1 golf course on the Big Island and #12 overall in the Top 100 by Golf Magazine making the course a benchmark for all other courses in Hawaii. Members can also enjoy the highly acclaimed oceanfront 11-court Seaside Tennis Club, two fitness centers, Museum quality Pacific and Asian art collection, numerous restaurants and soul soothing therapies and body treatments at the new Mauna Kea Spa. Enter this Mauna Kea Resort home offering you complete privacy and 180 degree ocean views in the South Fairways of the resort. Highly distinguished interior designer Christian Grevstad, and owner of his own notable award-winning interior design firm, remodeled this 3,500 square foot home into an enchanting slice of Big Island paradise. Fully embracing Hawaii’s precious views and nature, the homes multiple glass walls will maximize natural lighting to illuminate the gorgeous interior design of the home. The home uses terrazzo Italian Carrera slab marble and imported glass tile extensively, also includes many contemporary and mid-century art along with top-of-the-line imported furnishings from Europe. The current owner added new floors, fixtures, appliances, wall treatment, rebuilt the pool, created the driveway, added the carport and storage units, new landscaping (palms, Royal Poinciana, Hong Kong Orchid, plumerias) and built the detached two bedrooms. Overlooking the turquoise waters of Kauna’oa Bay with Maui views and nightly sunsets to dazzle, this is a must-see. A stunning contemporary home whose interior was designed by award winning interior designer, Shay Zak. Step inside this island-inspired pod style home, assuring you utmost privacy, to discover elegant clean lines throughout its design and generous proportions. The contemporary effect of the home is exemplified in the minimalist design all throughout the house. A brief 5 minute walk along a residents-only walking path takes you to Mauna Kea Beach, unarguably one of the most spectacular beaches in all of Hawaii. Homeowners also have the chance to become a member of the remarkable Kaunaoa Country Club. The club offers plentiful fine amenities such as access to the Weiskopf Designs Par 3 Golf Course, infinity pool with adjoining rock spa, state of the art gym, spa and concierge services, and a club pavillion crafted from African mahogany equipped with your own mahogany locker in the temperature-controlled wine storage room. When it comes to finding the best of the best, Harold Clarke at Luxury Big Island is ready to listen to your specific needs and is highly skilled at finding the perfect home to meet the particular desires of each of his clients. To find someone who truly masters the art of human connection to match person to place is a truly rare commodity in the world of luxury real estate. Bringing to the table years of experience in Big Island real estate and a deep knowledge of the island’s regions and communities, he looks forward to hearing from you and answering any questions you may have in order to provide you with all the information you may need.